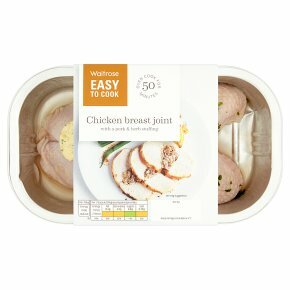 Boneless breast joint of tender chicken, basted with chicken stock, stuffed with a coarse cut sausagemeat stuffing, parsley and thyme, hand finished with lemon and thyme butters. Tender and juicy in 50 minutes. INGREDIENTS: chicken breast (75%), pork belly, water, onion, butter (milk), wheat flour fortified (wheat flour, calcium carbonate, iron, niacin, thiamin), lemon zest, lemon juice, salt, parsley, thyme, sugar, pepper, emulsifier (sunflower lecithin), yeast.